Novomatic want to take you on a fairytale journey to a magical land with this fairytale theme slot. Many girls grow up wanting to be a princess or a heroine. Many boys grow up wanting to be a prince or a hero! Kids films, books and stories are filled with tales of magical lands and love fantasies. 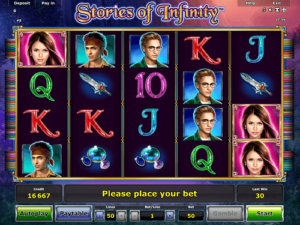 Once upon a time at Novomatic, the developers decided to make a new slot game! They chose to tell a story about two princes, a princess and a dragon. In a faraway land, in a valley between two tree-covered mountains lies a castle. This castle is just like Disney’s Cinderella castle. It has many towers and turrets, and looks like the perfect place for a princess to call home. In this Novomatic wonderland, the video slot has 50 paylines. You can play with any number of paylines; you don’t have to play with all 50. Use the buttons to select your desired number of paylines. Then you can use the buttons to select your preferred bet per active payline. As is characteristic of Novomatic, all of the rules and payouts are found in the paytable. In addition, you can gamble payouts if you desire, and you can also play in automatic mode. Choose Stories of Infinity if you want to have a happily ever after. The theoretical payout percentage of this slot game is over 95%. You will get your happy ending in Stories of Infinity when you win! To win in this slot game is like any other slot game. Matching symbols pay. The more consecutive matches you get from left to right or from right to left, the more you’ll win! 3 is the minimum number of matches that pay for all symbols. All symbols also can pay for 4 matches and 5 matches. The princess symbol is worth the most. She’s a beautiful brunette! The two princes don’t pay as much as her, but they pay more than any of the other symbols. The remainder of the symbols include: gemstones, a mighty sword, A, K, Q, J and 10. The Wild symbol in this slot is a silver dragon with gleaming scales. All of these symbols can be substituted by the dragon Wild symbol in a win. The dragon only graces the middle three reels, so you won’t see this magnificent creature on reels 1 or 5. For other Novomatic slot games with dragons in, you can play: Dancing Dragon, Dragon Pays, Viking & Dragon, Little Dragons, Dragon’s Deep, Elemental Dragons, Dragon’s Wild Fire, Eye of the Dragon and Dragon’s Pearl. Free Spins are just one happy thing that can happen in this Novomatic casino slot game. You can get up to 50 Free Games in a single spin if you’re lucky. The symbol that awards the Free Games is the castle symbol. The Cinderella-like castle is an incredible work of architecture – you’ll want to move right in! 3 of these castle symbols anywhere on the reels will trigger 10 Free Games. 4 castles will give you 20 Free Games. For 50 Free Games, you’ll need 5 castle symbols. The castle is the Scatter symbol so it can land wherever it wants. Sometimes, the castle symbol will have a number on it. These numbers appear randomly and are: +2, +3, +10, +20 or +50. If one of the castle symbols that trigger the Free Games has one of these numbers on it, you’ll get the same number of additional Free Games!